Simple, complete mix for falafel with a bit of spice kick - just add water. 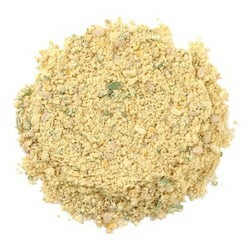 Also use to coat chicken, replace bread crumbs in meatballs or in pita bread as a sandwich. Directions: Add 1/4 C. boiling water to 1/3 C. mix, stir, cover and let stand 5 minutes. Form into patties and bake at 400 degrees for 10 minutes. Ingredients: organic garbanzo flour, sesame seeds, lemon peel, onion, garlic, parsley, cumin, coriander, black pepper, cayenne, turmeric.